Man of La Mancha returns to London for the first time in over 50 years. 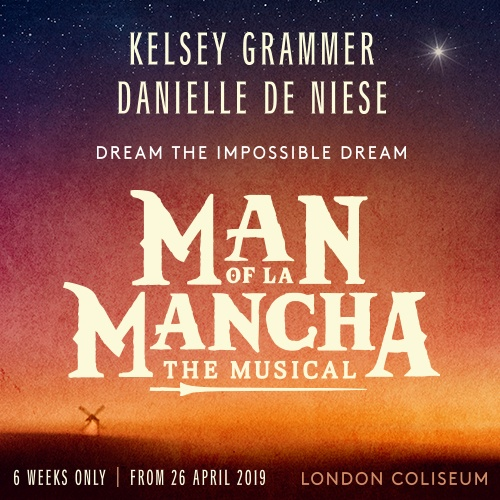 Featuring the iconic song ‘Dream the Impossible Dream’ and inspired by Miguel de Cervantes’s masterpiece Don Quixote, this classic tale opens at the London Coliseum on 26 April 2019 for a strictly limited six week run. In a 16th century dungeon, Cervantes and his manservant await trial from the Spanish Inquisition. In his possession, he has a trunk, carrying an unfinished novel Don Quixote. As prisoners attempt to steal his possessions, Cervantes embarks on acting out his novel as his defence, transforming himself into Alonso Quijano. Chivalry abounds, in this classic tale of knighthood, love, loyalty and adventure.